Episode 16: WTF is TFC? “People think these staircases occur naturally,” says Nova. During the rest of the year Nova is known as Alex Milde. Alex is a clean-cut student at Cornell and a member of its varsity rowing team. But out here, in the wilderness of the White Mountains, he’s the leader of a trail crew and he goes by his woods name: Nova. “We’ve had people do that. They’ve been walking down our work, talking to their kid, and we’re rolling around in the dirt, clearly putting in a staircase, and they’re like: ‘Yes, honey, these steps were put here by God.’” But they weren’t. They were put there by a crew of people -- mostly college students, working mainly with hand tools -- who labor in obscurity all summer long. 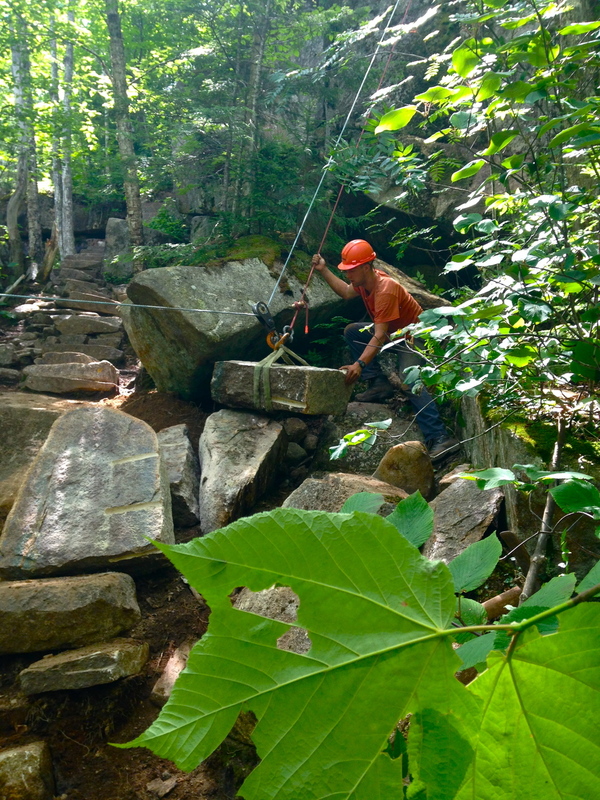 Officially, this is the Appalachian Mountain Club’s professional White Mountain trail crew. Unofficially, it's known as: the TFC. 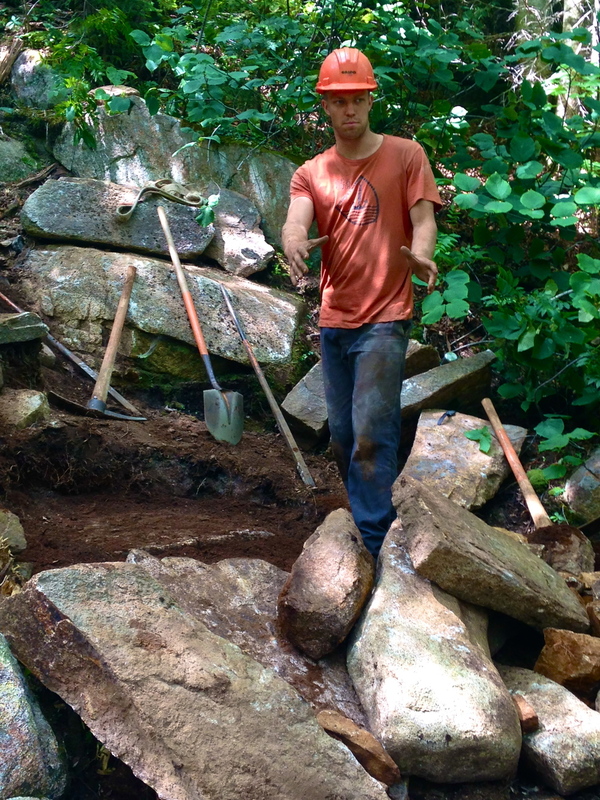 AMC’s White Mountain trail crew has been around for a long time. 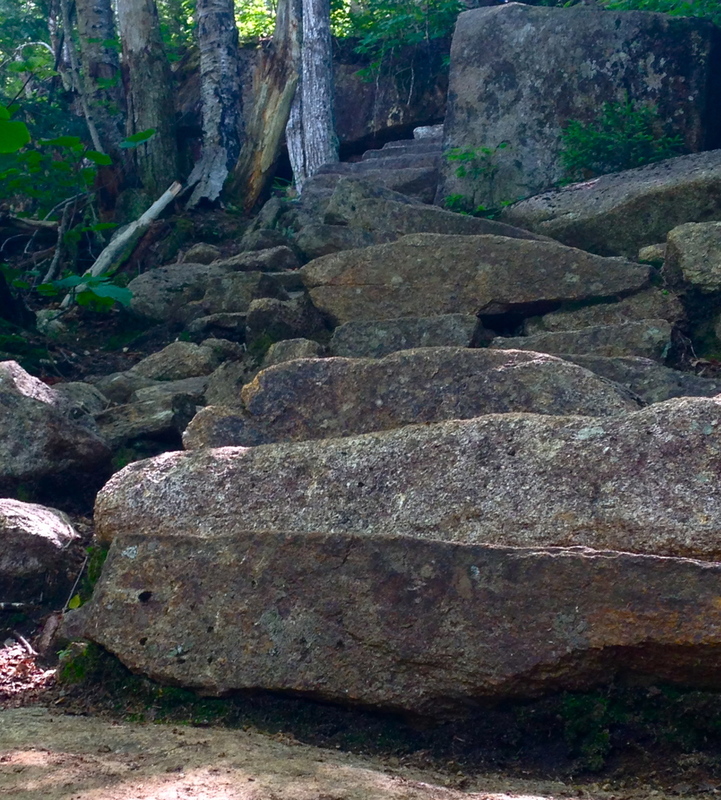 In the 1800s, hiking trails were largely cut by the owners of inns and hotels in the White Mountains. In the early 20th century some of the area’s more dedicated hikers, often faculty members of the region’s universities, started to connect these trails. 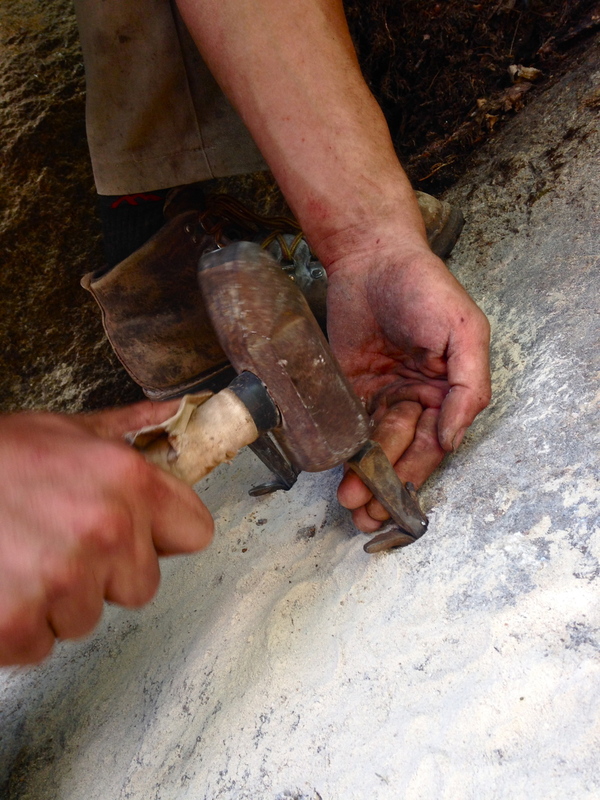 The result was a trail network that was too big to be maintained by volunteer labor alone. 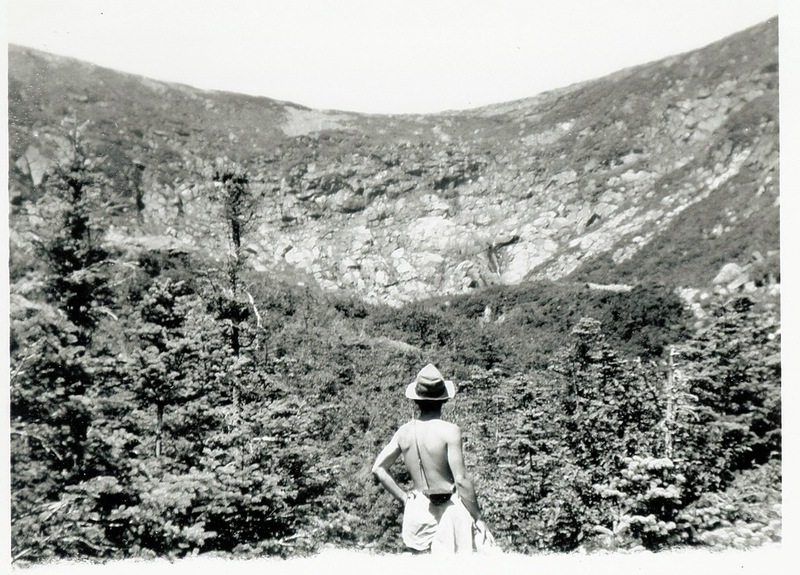 In 1919, the Appalachian Mountain Club formed its first professional trail crew, led by former New Hampshire Governor Sherman Adams, who was fresh out of boot camp and ran the crew accordingly. “He had a reputation,” says Bob Watts who served on the crew from 1952 to 1955 and now serves as the crew's unofficial historian. Watts says Adams once hiked from Littleton to Hanover in something like 43 hours. L to R: Harland P. Sisk 1923-26(TM), Leonard B. Beach 1923-25, William J. Henrich 1924-27(TM), William L. Starr 1922-25(TM), Frederick Fish 1923-25, Harold D. Miller 1920-23(TM) & 24(TM), Dana C. Backus 1923, 24 & 26. That superhuman trek was somewhere in the neighborhood of seventy miles, and Adams did it without Gore-Tex® gear, lightweight boots, or a CamelBak®. The culture that Adams created on the trail crew--hard living, hard working, hard charging--remains today. And in the intervening years, the crew has cultivated a mystique that surrounds them still. Why is the TFC so legendary? Crew members are expected to do “patrols” for two to three weeks each summer. "Patrols" involve hiking between eight to twenty-two miles a day, clearing every fallen tree from the trail, and a year’s worth of accumulated leaves and dirt out of every water bar. Once patrolling is done, the crew then gets to work on projects. In order to reach the project site, often set deep in the woods, they must pack and carry a week's worth of equipment and food. Their backpacks, which are technically pack boards, usually weigh more than 100 pounds. The TFC boasts that particularly burly crew members will carry 200+ pound loads. There's even a story of an unfortunate crew member who became momentarily trapped under river water after being toppled by the weight of his packboard. These brutal workdays are accompanied by some equally punishing days off. 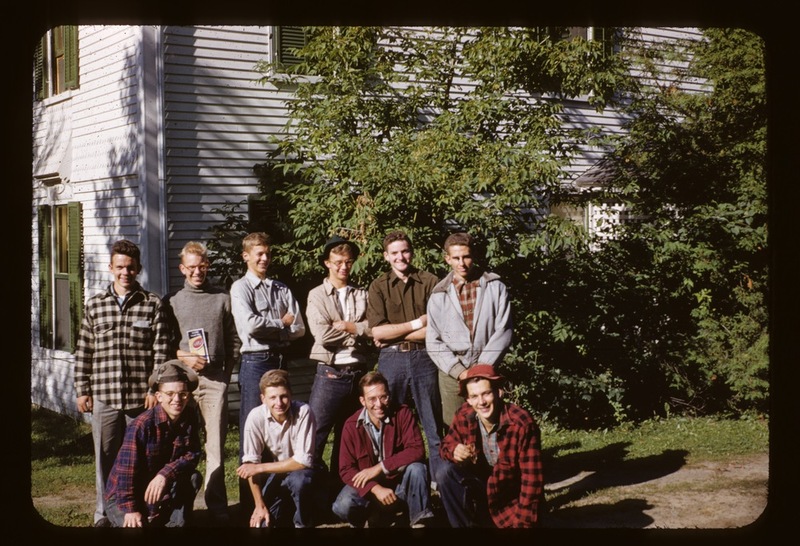 Bob Watts reminisced about an impressive, but perhaps ill-advised, hike that he and his crew mate embarked on one summer. It took them 27 miles to the next project site and over Mount Washington (one of the most inhospitable peaks in the country) in the middle of the night. Every year, crew members take part in the fabled, 49-mile “hut traverse”. The trail crew is legendary for being composed of spirited college kids with a penchant for pranks. The most notorious example went down in the '50s when some trail crew members caught wind that President Eisenhower was coming to visit New Hampshire. They decided to put a goatee on one of the state's more notable icons, the Old Man of the Mountain. To do this, they managed to tie some bushes to his rocky chin, which was located forty feet below a cliff edge; all of this just to give him a funny little beard. “So these guys really, for almost a half a century went into hiding and never would admit their participation in this shenanigan,” says Watts. This tomfoolery is harmless, but I’m also fairly certain they are some of the more PG stories. If you asked me to guess, the most legendary tales, the kind that attract new crew members from college campuses all around the country, don’t get told to a reporter carrying a microphone. To match the mystique they’ve cultivated over the years, the crew has adopted a certain style. Members of the crew don’t look like earth-loving hippies, or tech-fabric wearing ultra-athletes. They’re more like filthy, muscled punk rockers, wearing heavy work boots and stained t-shirts. Many of them sport mohawks, which they say optimizes their aerodynamics for hiking fast. What’s it like to be on the TFC? Joan Chevalier was the first woman to be on the trail crew back in 1978. She had worked in the huts, but was always envious of the trail crew. “I wasn’t really a people person, per se,” she says. She started in the huts, and eventually became the caretaker of Guyot shelter the summer it was being rebuilt by the the trail crew, so she worked closely with them. Afterwards, the head of the crew invited her to join the team. 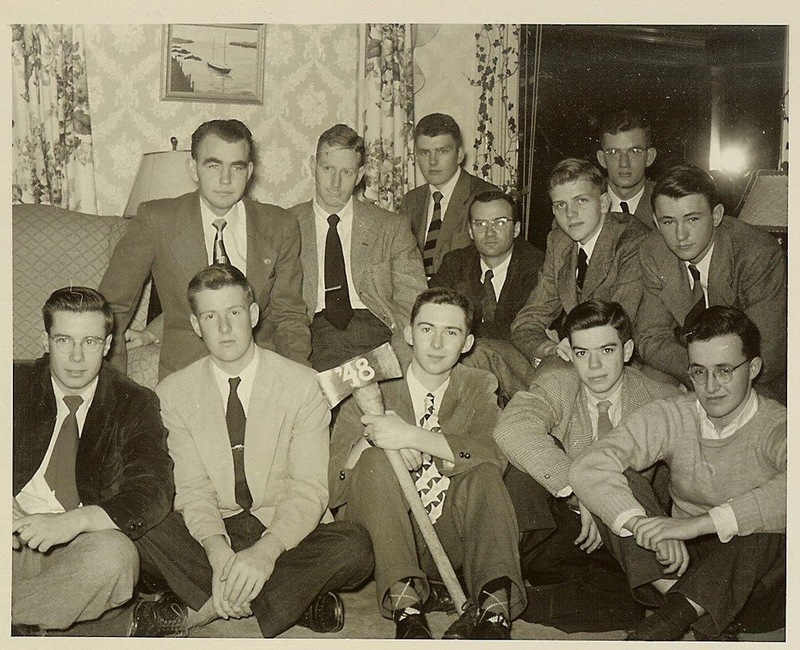 There are echoes of fraternity culture in the TFC’s traditions. But when it comes to telling the best stories of fun and fellowship in the woods, the ones that bring in new trail crew members year after year. Ben English and John Lamanna demure. So there you have it. If you want to know what it’s really like to be on the TFC--the heavy loads, the long-days, the shenanigans in the woods and the life-long friendships -- you’ll just have to join up yourself. 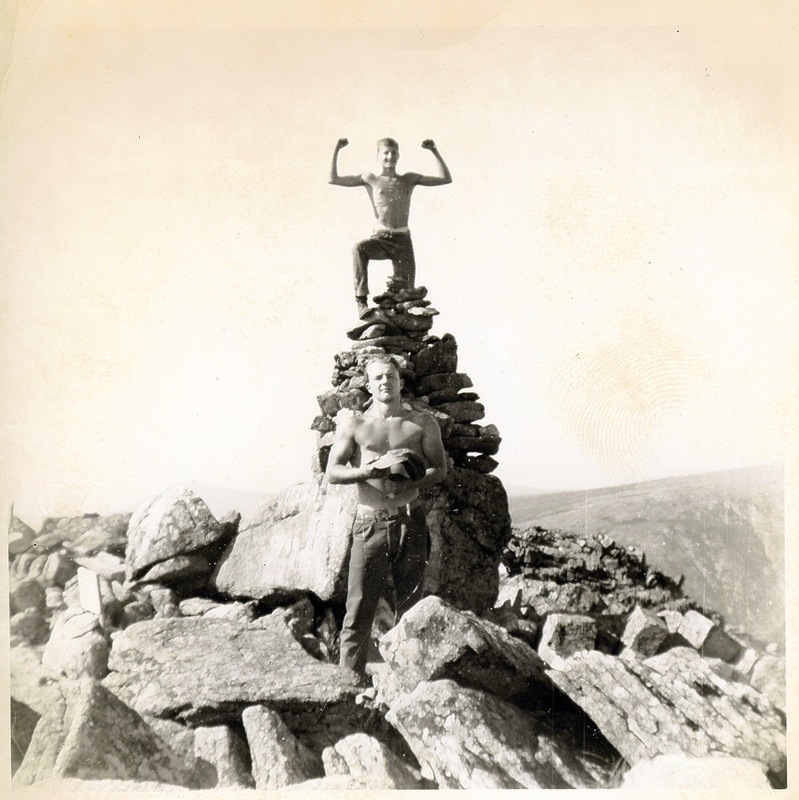 Ted Brown recalls: "That is Jack Hutton who was trail master during July of 1943. On August 1 he went into the Marines. The dog is Brandy, and the woman is Jack's wife Catherine Rockefeller - i.e. Rocky. She stayed in Whitefield for the rest of the summer, doing the cooking, etc. and giving us directions based on detailed instructions left by Jack." On the right is Dana Backus, gent on “bicycle” possibly Paul Jenks. Note that there is a fourth person in the photo, hidden behind the gent on the bicycle. Historic photos courtesy of Trail Crew Association archives. Robert Moor is the author of a book called On Trails. Robert started thinking about trails while walking the Appalachian Trail in 2009, and decided to write about trails generally when he realized that no-one was interested in another story about a middle-class white guy walking the AT. Walking the AT does have a profound effect on people, it certainly changed Robert, as you can see from the photo below. Sam Evans-Brown, Logan Shannon, and Cordelia Zars. With help from Maureen McMurray, Taylor Quimby, Molly Donahue, & Jimmy Gutierrez. Special thanks to former TFC members Kyle Peckham and Natalie Beittel who are assembling a book of stories of people from the crew. Also Barbara Whiton of the Trail Crew Association who helped Sam track down old crew members. Thanks as well to Rob Burbank of the AMC and Cristina Bailey of the National Forest Service for setting up the day out on the trail.